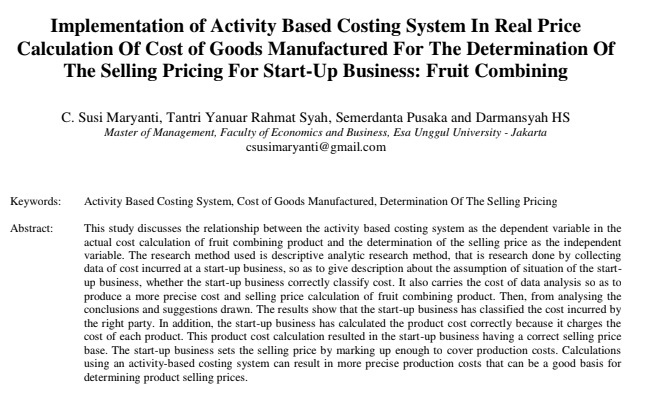 This study discusses the relationship between the activity based costing system as the dependent variable in the actual cost calculation of fruit combining product and the determination of the selling price as the independent variable. The research method used is descriptive analytic research method, that is research done by collecting data of cost incurred at a start-up business, so as to give description about the assumption of situation of the start-up business, whether the start-up business correctly classify cost. It also carries the cost of data analysis so as to produce a more precise cost and selling price calculation of fruit combining product. Then, from analysing the conclusions and suggestions drawn. The results show that the start-up business has classified the cost incurred by the right party. In addition, the start-up business has calculated the product cost correctly because it charges the cost of each product. This product cost calculation resulted in the start-up business having a correct selling price base. The start-up business sets the selling price by marking up enough to cover production costs. Calculations using an activity-based costing system can result in more precise production costs that can be a good basis for determining product selling prices.